About a month ago, I read about how a website has more than 18,000 people on a waitlist for Rosé Gummy Bears. Sounds delicious, but why wait when you can make your own at home? I do love Rosé, but I thought why stop there? I’m going to make wine gummy bears of all types. Red, White, and Rosé. It almost sounds patriotic. 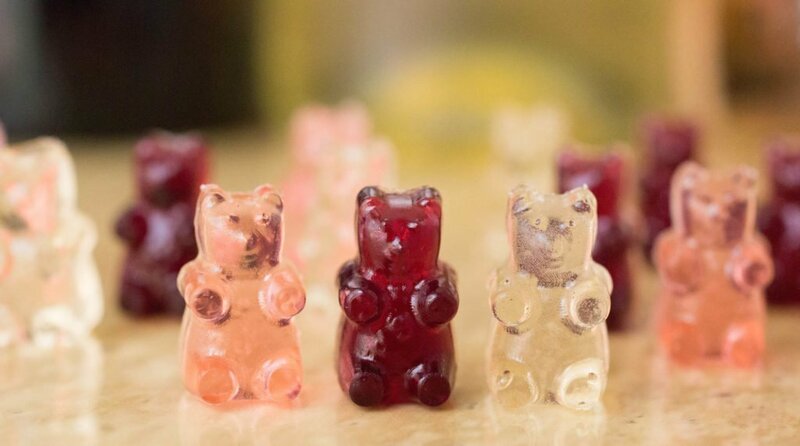 You may be surprised at just how easy it is to make your own wine gummy bears. All you need are two gummy bear molds, some gelatin, and a little sugar.
. To retain the alcohol, it needs to stay at 160 degrees or below. I think they truly turned out to be tasty. The red wine gummy bears were my favorite, while Janette was rather fond of the Rosé. If I made them again I would like to do some fun variations, like maybe mix some peach juice with some Moscato for the white wine version. 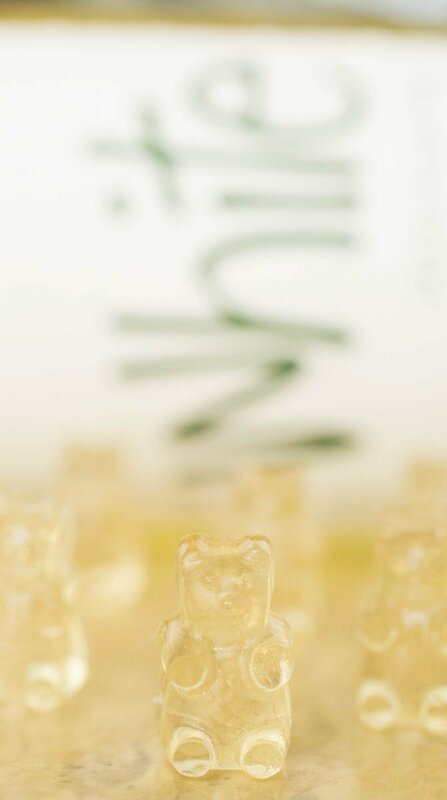 I could also see myself making some champagne gummy bears in a few months to help ring in the New Year! 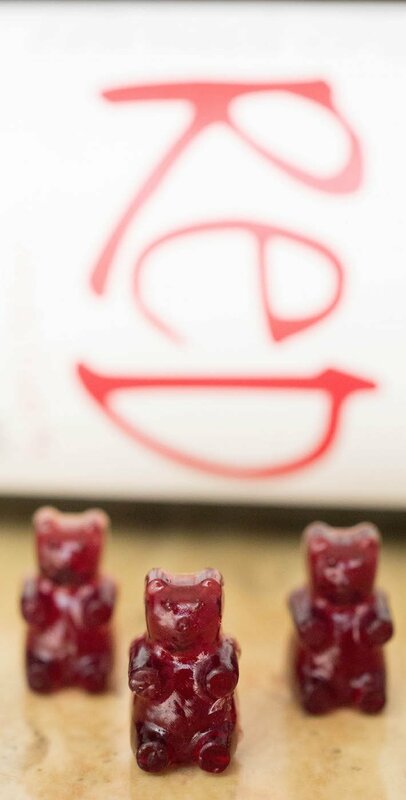 I hope you enjoy this wine gummy bear recipe as much as we did. Update! : I never knew this little recipe would take off like a rocket ship! With thousands of different people testing the recipe and giving feedback, I have tweaked it a little and amended the amount of gelatin. Hope you enjoy! Makes about 125 gummy bears. I’m not sure how that would work out for this recipe since there is no water, only wine. You could try it, but the gummy’s would be watered down both in flavor and alcohol content. Do you have to pour the liquid into the molds with a glass container? My molds came with a plastic syringe. Can I use that? Yes, you can use an eyedropper or syringe. It is just tedious and time-consuming. why does your recipe have 3 TB of gelatin and the video has 5 TB ?? Read the update right above the recipe. I tweaked it after so much user feedback. 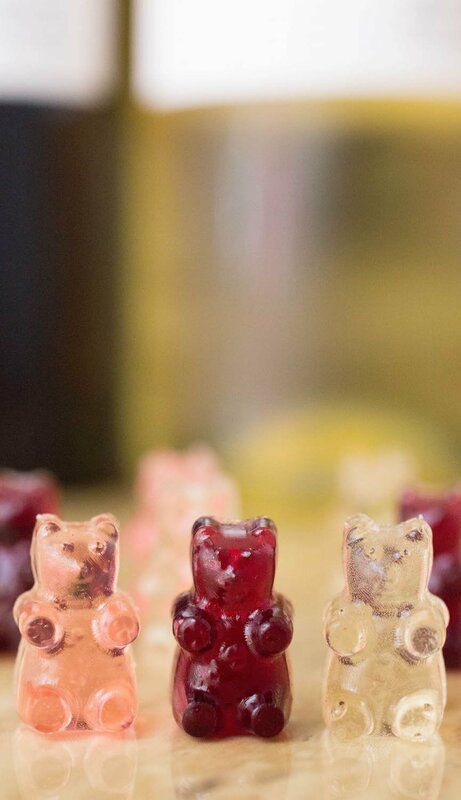 These homemade wine gummy bears are made with red, white or rose wine and are perfect for a party or for gifting this holiday season. My gummy bears didn’t mould…I followed the recipe. Do have any suggestions? I used moscotto wine. Hi Tami, I’m not sure but I can try to troubleshoot. Did you use gelatin (not jello), and did the gelatin completely dissolve when you were heating it up? Love the recipe, though I have to admit I didn’t follow it exactly. I’m curious about the consistency of your gummies! My flavor is great, and they are nicely set up, but I find the consistency just a bit off putting. Still very tasty, but just slightly odd! Do you (or anyone else that has tried this) feel this way? Is it just my shameful lack of following directions that has left me feeling this way? ? When people say to add cornstarch to handle the stickiness issue, do you mean to add it to the recipe before setting, or dust the gummies in cornstarch? I want to make a mix of Red, White, & Rose to put into mini mason jars for my sister’s bridal shower, and I want to make sure they come out just right. I made a test batch of white today (using the only mold I had – legos, lol), and they seemed to come out great. But I don’t want them to get stuck together or lose the texture/consistency/taste. Any advice would be much appreciated. This might be a dumb question, but for the Rose gummies, do you actually use rose or just white wine with the pink food coloring? If so, which rose did you use? Thanks! I used Rosé. It was my local grocery store, Bristol Farm’s, brand. If I use Dr.oetker gelatin rather than knox how much would I need? To Diane Schrum, obviously you didn’t read the directions , nor have you tried them! Making yourself look pretty dum! Directions say to not let temp go above 90 degrees so the alcohol doesn’t evaporate! 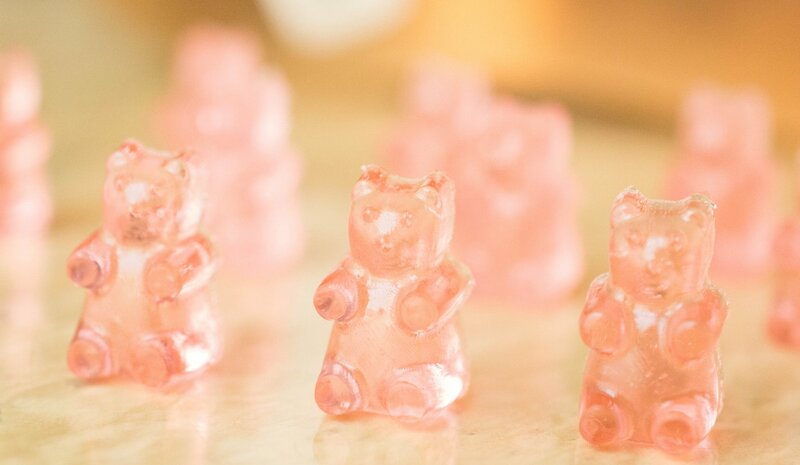 These gummy bears are easy to make, look adorable and are a sweet treat….if you don’t eat sugar don’t make candy. I used a Zinfandel, rose and vino verde. You can use whatever liquid you want. They are inexpensive so play around with it. I would like to figure out how to make them more ‘durable’, by that I mean to make them so they don’t need to be refrigerated. I’d like to be able to bring them to a party but then they get very soft when witty out to long. Anyone know what it would take? Please let me know if you have discovered a way to do this?! I want to bag mine for gifts!! Thanks so much for any and all advice!! I still can’t find where the revised gelatin measurements are. Hi Jessica, Im a little late to the party here, but how do you keep the gummy bears from getting sticky after theyre set in the fridge? Do you put anything on them? I have actually never had an issue with my bears sticking together. Perhaps it’s because I live somewhere with very low humidity? You could try sprinkling a little cornstarch over them and shaking them to make sure they are all coated with it. Where can you buy the gummy bear trays?? OMG amazing. We made wine ones and then branched out to tequila lime. Yum!!!! I used a simple, Liberty Creek red wine and they came out great! Except, I found them to be too sweet, so next time I probably won’t use the sugar (or just 1/4 cup instead).